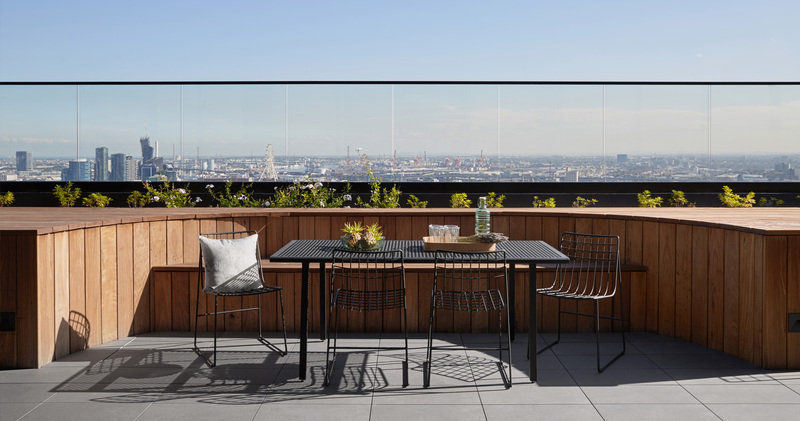 Welcome to Royal Elizabeth, a premium residential address on the northern edge of Melbourne CBD. Completed in 2017 it comprises 180 high quality apartments with 1, 2 or 3 bedrooms, as well as secure basement carparking, on-site building management, a cafe and a full level of resident lifestyle amenities. Royal Elizabeth provides convenient accommodation close to the city, universities and hospitals and a level of livability and quality seldom seen in buildings of this size. 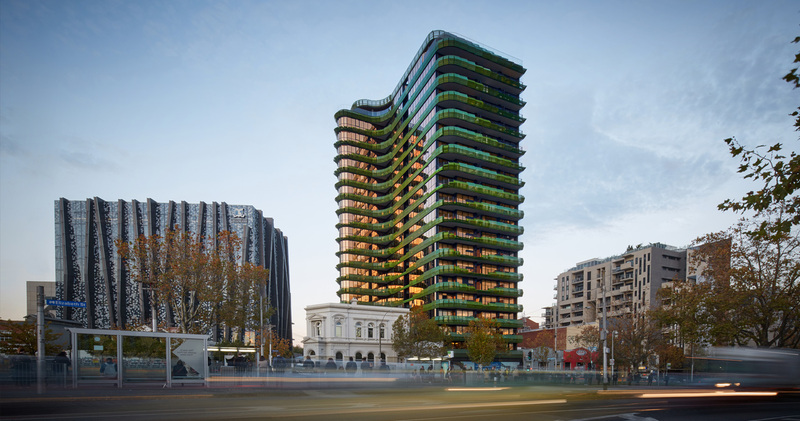 Inspired by the iconic Australian gum trees that line Royal Parade, Royal Elizabeth's contoured façade is a symphony of forest hues in five different greens, with five unique shapes of aluminum balustrade screening. Each profile occupies a different position to consecutively bounce light as the sun moves from east to west and to offer tactile variation across the façade. This foliage wraps around the whole building providing sun protection, whilst a laser-cut pattern in the screens filters dappled light through to the apartments inside. Bronze-glazed glass shimmers out from between the leaves representing the gum tree's bark and providing privacy and insulation. 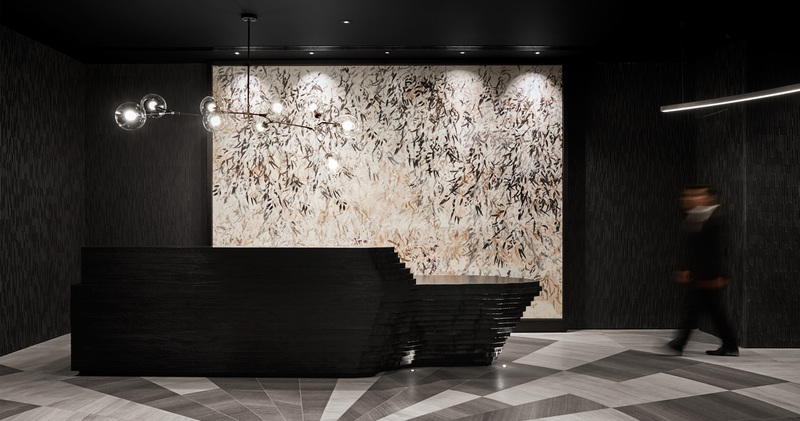 Royal Elizabeth was designed by Elenberg Fraser architects in conjunction with the PDG design team. At canopy level on the 19th floor is a warm, communal area for relaxing, entertaining and working out. All residents will be able to enjoy the panoramic views and sun-drenched spaces year round, whether entertaining friends in the private dining room, relaxing in front of the fire on a winters day, enjoying an alfresco summer barbeque on the landscaped terrace or working out in the fully equipped gymnasium. At the culmination of Elizabeth Street and Royal Parade were Carlton meets the CBD, Royal Elizabeth takes its place amongst the cities knowledge precinct. This prestigious area is dotted with pocket parks and cafes and is home to the University of Melbourne, RMIT, the Royal Hospital, Royal Woman's Hospital, Royal Children's Hospital and the new Victorian Comprehensive Cancer Centre. Founded in 1985, PDG is a privately owned, customer centric, property business focused on providing quality spaces to live and work in metropolitan Melbourne. 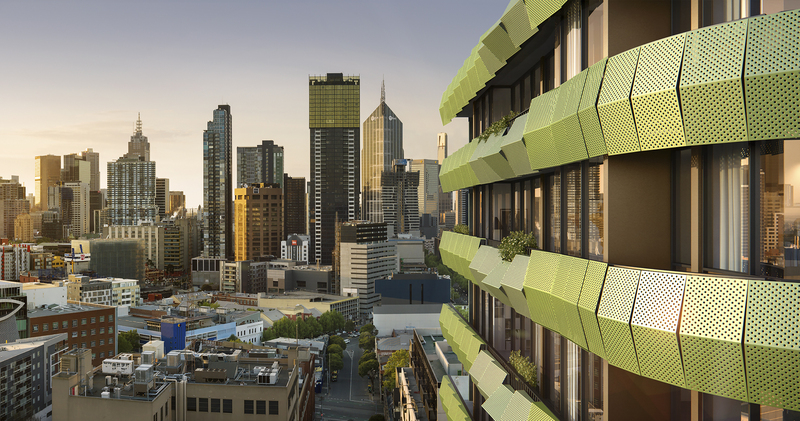 With a track record for creating some of Melbourne's landmark commercial and residential properties, PDG has secured a reputation for excellence, innovation and customer care. The growth and success of our business is built upon choosing the right partners to work with, selecting and maintaining a highly motivated and forward thinking team of staff and keeping our customer top of mind in every decision we make. PDG are proud to be working in-conjunction with the SSS Group as joint developers. SSS has been operating in the automotive industry for over 25 years. As land owners of this premium CBD edge site, their vision was to create a high quality residential building which would greatly improve the value of the land and offer residents a fantastic array of amenity both within the building and in the immediate surrounds.